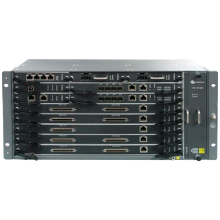 B1205 is a cost effective & versatile Digital Loop Carrier (DLC) and Multi Service Access Node (MSAN) optimal solution from UTStarcom that provides a unique set of capabilities enabling service providers to deliver the most competitive triple play service offerings. It enables service providers to smoothly migrate to IP based next-generation applications while continuing to offer traditional TDM based services to customers. The B1205 supports a range of technologies such as POTS, ADSL/ADSL2/ADSL2+, VDSL2, SHDSL(EFM) which allows the service providers to offer highly interactive and bandwidth intensive applications. B1205 Facts as a traditional TDM based DLC, IPDSLAM, Media Gateway platform rolled into one.